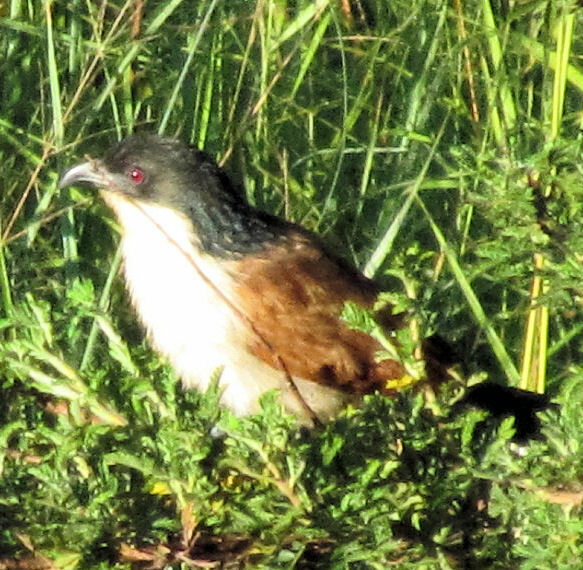 Spotted this Burchell’s Coucal below our deck next to the river, with a juvenile hidden further into the bush. Have also had an owl on our bedroom balcony balustrade at night. The call sounded like a wood owl although spotted eagle owls have been quite prevalent. Two crowned eagles circling low overhead yesterday while guinea fowl have re-appeared after a long break. 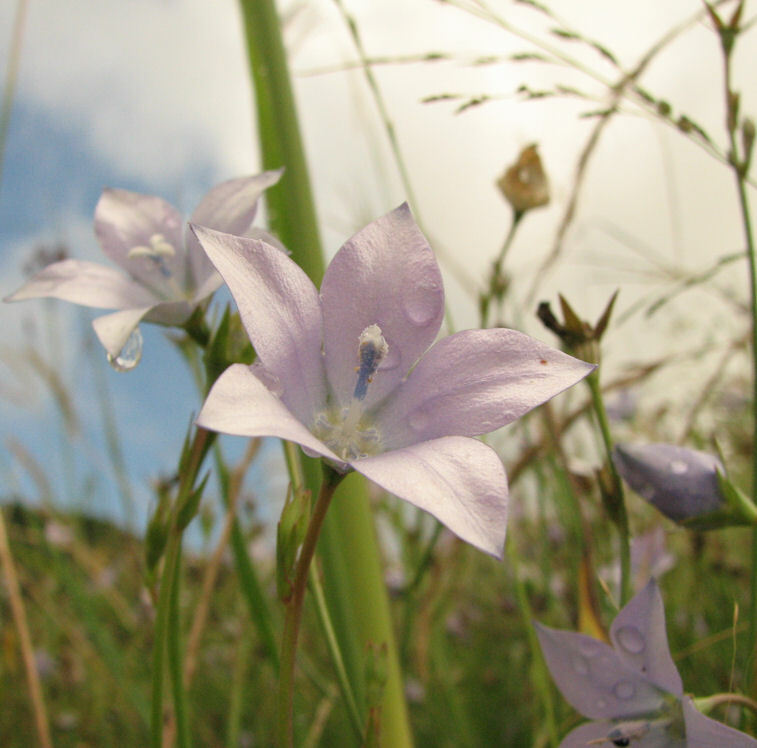 Grey duiker and reedbuck still seen despite the long grass and otter twice this month on the road adjacent the river. Quite a bit of jackal activity as well. We have spotted a Natal Green snake baking in the sun at the pond, very meek and mild, so beautiful. We have also spotted an eagle, some funny paw marks at the water hole -looks like porcupine and the biggest monkeys we’ve seen, around the forest. Our Jacobin cuckoo has been around most of March. It appears that a fiscal Shrike is it’s surrogate mother ! Haven’t seen it in the last few days. Perhaps it’s heading North? The Guerney’s sugarbirds are back, and Malachite sunbirds more in evidence. The aloes and leonotis are blooming so the sunbirds are out in full force. Derek saw a pair of black throated apalis in the garden and I spotted a Brubru Shrike( unusual) in the orchard. Lesser striped swallows breeding again! The Cape Batis has been calling, and the Gymnogene on the hunt in the garden. Our 6 or 7 Guinea Fowl have only 3 out of 8 chicks left. The domestic wild cats are about and sadly have made a meal of them, we think. This last week we have had our own mini ” Mount Morland “. Between 5 and 6 pm, hundreds/a thousand barn swallows congregated behind our house in the very tall Silky Oaks and the sky above has been filled with them flying, swooping and diving. An amazing sight. All the more so, in that we don’t often see Barn Swallows on Kildaragh, only the Lesser Striped. Where do they come from, for that one hour, and where do they go to after their get together? I note with interest that quite a few people saw that grouping of YB kites. About 3 weeks ago we lost an nguni cow to red water. There were huge groups of yellow billed kites that fed off the carcass as well as the jackals, of course. A lot of crows were also fattening up and fights between them and the kites were interesting. Between the birds and the jackals the carcass was completely cleaned up in 2 days. Terrible smell in our chimney – Pat had to unscrew flue and found half eaten rat – the barn owls once again. They are still here in the eaves even though we have made them an owl box. At 9am last week saw a jackal running down the D18 road – it ran ahead of the car for about 2kms before shooting into the bush. A very persistent bull frog (grey and large – about 7 x 4 inches) keeps digging itself into my geranium pot each morning. Gives me such a fright every time I go to water it, as I think it is a snake. 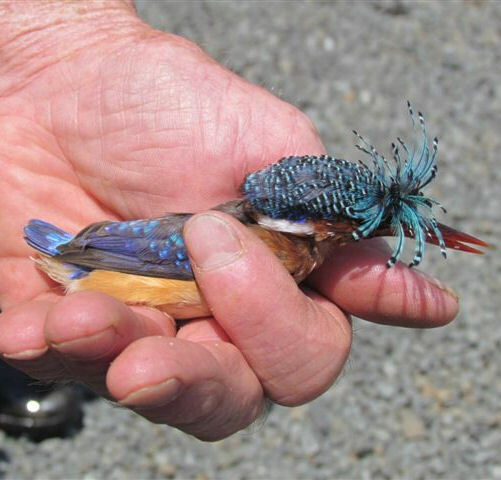 Pat rescued this Malachite Kingfisher which was trapped in our garage. It puffed up this beautiful crown of feathers – probably from fright. Saw a large pack of hunting dogs and their handlers. Guinea Fowl with lots of youngsters, chameleons still on my birdfeeder, lots of birds about, interesting cat/mongoose like creature with black legs, a curved back and long tail (any ideas?) late at night, catching rats. Big beautifully striped serval cat on the D666. About 45cm tall with long legs. 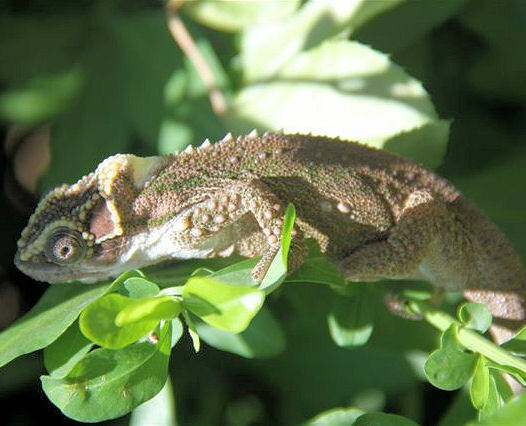 Beautiful chameleons in our garden. Little bats in the evenings swooping over the fields. Lots and lots of wonderful Jackal howls in the very early mornings. Rabbits and Owls on the road at night. Female bushbuck on the edge of the forest. Birds: 2 Cape Parrots flew over – I haven’t seen them for ages. Heard them calling on a couple of other occasions. Blue cranes heard a few times. Gumnogene, Cormorants, pair of Yellow billed ducks, Pied Crows, Stone Chats, Jackal Buzzards, White eyes, Mousebirds, Thick billed weavers, Southern Boubous, Cape Robins, Thrushes, Rock Pigeons, Ring necked Doves, Grey headed Sparrows, Bulbuls, collared Sunbird, black Sunbird, Fork-tailed Drongo, Knysna Loeries, Hadedas. This entry was posted in Uncategorized on April 9, 2012 by Midlands Conservancies Forum.